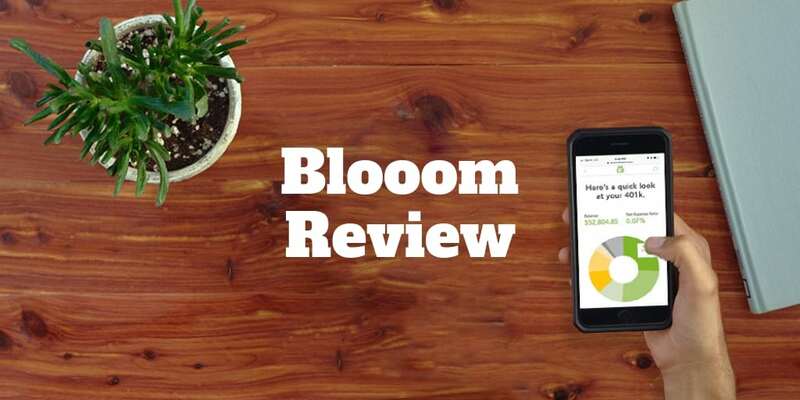 Home › Investing › Robo-Advisor › Blooom Inc – 401(k) Automatically Managed For $10/mo? Blooom Inc – 401(k) Automatically Managed For $10/mo? blooom Inc specializes in managing retirement plans like 401(k)s automatically. Most other online money managers avoid these retirement plans like the plague so blooom earns high marks for tackling workplace retirement plans head on. Beyond 401(k) portfolios, blooom automatically manages defined contribution plans, like 403(b)s, 403(a)s, 457s, and thrift savings plans. If you have a workplace retirement plan that causes your eyes to glaze over, you will want to read on. Where blooom Inc shines is by analyzing your retirement account holdings and weightings for free, and managing them automatically for just $10 per month. Fix Your 401(k) In 5 Minutes? Is blooom Inc Right For You? How Much Is blooom Inc? blooom makes the lofty claim that it can fix your 401(k) in 5 minutes and delivers on its promise. It only takes a few minutes to link your workplace 401(k) plan to blooom. Your company doesn’t need to have a prior relationship for you to reap the benefits. blooom is best for investors with employer-sponsored plans, who are fee-savvy, and lean towards being more risk-seeking investors. According to blooom Inc, clients have collectively saved over $600 million in fees by using its service. And it’s no surprise that it has become so popular because it solves a real problem. Puzzling over retirement plan choices is often a game of chance for employees. Few employees have the time or interest to research mutual fund expense ratios, ongoing fees, and performance returns of each fund selected. To save employees the hassle, blooom takes over the process of selecting your portfolio holdings and allocating them. blooom portfolios lean towards a heavier weighting of stocks than bonds so conservative investors should pay heed. Regardless of your risk preferences, you can enjoy free portfolio analysis to gauge whether opportunities for improved portfolio selections and allocations exist. The bottom line is that for the vast majority it makes sense to hand over the responsibility of retirement plan management to blooom. blooom monitor your portfolio contintually to make sure it is optimally balanced, and rebalances it every 90 days. Sometimes blooom may not have much choice other than to select a high cost fund because employer-sponsored plans are limited to a fixed set of choices usually. Often, only one choice of fund exists in an investment category. But while blooom may run into a brick wall from time to time when it comes to fund selections, it can still make decisions about the optimal amount to invest in each fund in order to keep the overall portfolio composition balanced. blooom doesn’t impose any hurdle to get started so it’s ideal for price-conscious investors. It’s 100% free to connect your 401(k) and analyze it, and no account minimum is imposed either. blooom charges a flat fee monthly regardless of how much money is in your defined contribution plan. blooom charges a monthly fee of $10, which is about the cost of a Netflix subscription. It’s hard to argue blooom is expensive at that price but if you have a small portfolio it might be a lot in percentage terms. Whether you have a $10,000 portfolio or a $100,000 portfolio, blooom charges the same $10 flat fee monthly. Someone with $10,000 pays 1.2% in fees on managed assets compared to just 0.12% for the person with $100,000. blooom stands alone as the only robo-advisor willing to directly manage your 401(k) retirement portfolio. In the highly competitive field of robo-advisors, you might expect that blooom has lots of rivals but remarkably it stands virtually alone. Unlike standard taxable accounts, IRAs, Trusts, and a host of other financial accounts, 401(k)s are quite messy to manage. Employers often feature a limited pool of funds and each employer has a slightly different take on which funds are offered to employees, so the process is by no means standardized. By contrast, a robo-advisor like Betterment can select from the entire universe of index funds when building client portfolios in non-401(k) accounts, which is precisely why so few robo-advisors compete with blooom. But tens of thousands of businesses offer 401(k) plans to employees so there is a real opportunity for a brave robo-advisor to help the average Joe or Jane out, and so far blooom stands alone as the single company willing to directly manage 401(k)s using a technology-powered algorithm. Personal Capital and Vanguard Personal Advisor Services will provide guidance to clients who hold 401(k)s but they won’t directly manage them, so blooom really is your only answer if you want a hands-off approach to managing your 401(k). blooom strives to improve portfolio returns by removing funds that don’t align with your retirement goals and by inserting funds that better meet your objectives. Analyze funds in your existing 401(k) and remove ones that don’t align with your retirement goals or have higher fees than alternatives. Choose index funds to keep fees low unless an actively managed fund is a better choice to gain necessary exposure. After choosing the optimal funds to meet your target allocation, blooom chooses funds with the most competitive expense ratios and managers’ experiences. Lastly, blooom cross-references and verifies results to ensure they comply with your recommended 401(k) allocation. Both fund selections and weightings are assessed every 90 days and rebalanced if necessary. Over time, when retirement looms closer, blooom automatically adjusts the weightings of stocks in your portfolio down lower to better suit your lower risk tolerance. blooom imposes no account minimum, analyzes your portfolio for free, connects you to financial experts, and charges a flat monthly fee, but small account sizes will pay high annual percentage fees on managed assets. ✅ Flat Monthly Fee: blooom charges a flat fee monthly of $10 to directly manage defined contribution plan portfolios. ❌ Lack of Phone Support: No phone support is available via blooom, but email and live chat support is provided. ✅ Expert Financial Advice: Email and live chat support is available from financial experts so you can ask about more than retirement portfolio planning. ❌ High Fees On Small Accounts: Smaller account sizes will pay high percentage fees annually on managed assets. ✅ Regular Rebalancing: Every 90 days blooom rebalances portfolios if needed and notifies clients when changes are made. ✅ Free 401(k) Analysis: Even if you don’t sign up as a premium client, blooom will analyze your 401(k) for free. ✅ Zero Account Minimums: No account minimum is stipulated to get started. blooom supports the following employer-sponsored plans: 401(k), 403(b), 401(a), 457 and Thrift Savings Plans. blooom solves a real problem for retirement-oriented investors with employer sponsored plans who don’t know how much money to invest in each portfolio holding or aren’t sure which funds are best suited to meet their financial goals. The few robo-advisors who do venture into the defined contribution plan space only provide guidance. By contrast, blooom directly and automatically manages workplace retirement plan portfolios. The monthly $10 fee is low, though arguably for small account it is high on a percentage basis. Overall, we believe the value provided is significantly greater than the cost. ‹ What Is Financial Freedom?